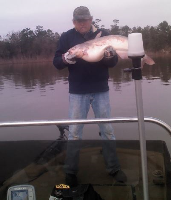 GRUMPY GRANDPAW - Lake Houston Fishing! I just found out to day that I will be getting a pacemaker for my heart this Friday @ 3pm. So I might not make the fishfry Sat. I will try as I have been looking forward to meet Yall. CK if I do get to go I won't be able to do much help as my left arm will be in a sling. The DR. says this will help me have more energy.The next thing after this is a Angiograthy to look for a possible heart blockage. Hope all goes well with the operation GG. Let us know how the recovery goes. 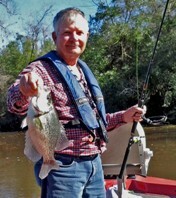 I talked with Lake Patrol a few weeks back and invited them to the fish fry. They said they will try to get a couple of guys to drop by. I told them a Q & A visit would be nice. Grumpy, wish the best for you. GOD Bless and hope you have a quick recovery, Will say a prayer for you. Grumpy, I wish you a speedy recovery. Thanks for all the prayers & good wishes. If they do not keep me over night I will try to be there. This has been confusing to me because last Nov. I had been told @ a Hosp. that my heart was OK but I had COPD. Now out of the blue on Easter weekend this stuff comes up I am very frustrated. My wife googled pacemaker & one of the things you can't do is use a chainsaw. Heck half the time I have to cut up laydowns just to get in my land & lease. I just pray the Dr's know what their doing .My faith is in God not man. Thanks again for all the prayers. The hosp. made the Dr. do the angiopathy first to see if I had any blockages that needed fixing. I didn't so he was able to do the pacemaker. I had to spend the night & got home @ 2:30pm. Now my wife & I are trying to set up monitoring device with no luck & of course the trouble shooter place is not open on the weekend. I have to see DR. Mon. am. I sure wanted to meet everybody sorry maybe next time. No fishing, driving or putting left arm above head for 2 months. Also it feels like somebody hit me with a bat in the left shoulder. That's good news that they found no blockage. Sorry to hear about the pain and inconvenience but do what that doctor says and you should be back on the lake just in time to chase some sunrise bass this summer. 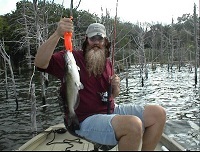 I know any of my sons or grandsons would cut the logs for me but being retired I am by myself most of the time .My wife thinks I need to quit fishing & hunting by myself but that is not going to happen. I was suprised my son didn't use the string method but I trust his judgement in the outdoors. WE have spent more times in the out doors together than anybody could imagine. More than 40 yrs. & still going. I have great memories of time outdoors with all three of my sons. Thanks WM for your thoughts. I was hoping to meet you but maybe on the water sometime this summer. A 19ft. green challenger with a fat man with a pace maker on the trolling motor.